This is a coupon for the BrillKids Shop ONLY: Cannot be used for distributors' websites or third-party websites. This Little Math starter set includes the Little Math software, one-year's worth of lesson content and two booklets to help you get started on teaching your child(ren) math. A ready-made curriculum already prepared for you. Teach the way you want to teach. 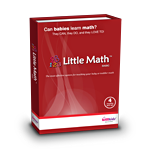 Little Math is not just a program which helps you to easily make math dots slideshows to show your child. It is also a powerful platform for you to deliver math lessons the way you want to! You can change the icons which show quantity to whatever icons you want to show - smileys, different shapes, and even your baby's own face! There's always something new to see and hear each day. Lesson content is different every day, and even the same day's lesson play back differently each time! This is made possible by randomization and rotation features in the software that pull from the vast media resources (different pictures, audio and video) in Little Math. Listen, repeat, and play while learning. Little Math is designed to be an interactive experience with full involvement by you. Throughout the lessons, your child will be encouraged to repeat words, count, and guess at the quantities and operations she hears and sees. It's never too early or too late to learn! Even though Little Math was designed with infants and toddlers in mind, it is suitable for children of all age groups. In fact, parents and older children are saying that they find the lessons and games particularly fun!